Visit PutBlurbLinkHere on our Main Site! The Ultimate in Modern Dvd Packaging! What would this do for your sales? 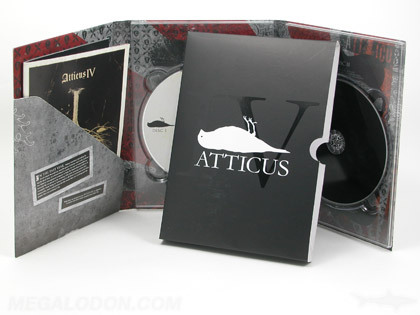 CDs in Tall Custom Digipak Packaging make for an extremely impressive package. The sleek Custom Tray Folder is 4C printed with a beautiful glossy or matte coating. We custom manufacture these to your specification, so we are able to vary the design easily. We can do some very creative custom folds like a cross or plus or book-fold. The clear tray (or trays for multi-disc titles) is tall dvd height and can go in any location, and the 4C printing is visible underneath. Pockets for booklets can be added in any style, and 4C Slipcases can be added to finish the package. Many of our clients choose special finishing options such as spot UV plus matte laminiation and reverse printing and hot foil stamping. Especially fun options: die cut window slipcases and eco-friendly fiberboard! Printing is done in conjunction with your offset printed dvds, so your entire package is coordinated and gorgeous. Also available: DigiClear & Acryllic slipcases, (totally clear boxes printed directly with up to 5C offset) and Fiberboard (earthy, natural, organic). For variations with the Mid-Height tray, go to the CD Custom Tray (Mid Height) page. Other Custom Tray Type Product, such as Extra Wide Panels, Special Folding, Tall Panels, More Panels, etc. Use Project Notes below.